Your Eastern Ontario home’s eavestroughing system is designed to move rain, snow melt and other moisture away from the property to protect the integrity of the structure and the foundation. However, gutters that are clogged with leaves and debris cannot move water effectively, which means you have to either climb a ladder and clear the passages by hand or hire it done. YOU NEVER HAVE TO WORRY ABOUT CLEANING EAVESTROUGHS AGAIN! Free yourself from the bothersome chore of having to clean out your eavestroughs once or even several times a year. Clogged eavestroughs are a thing of the past; with state-of-the-art technology from Alu-Rex, you will never have to worry about cleaning your eavestroughs again! At Bourgon Eavestroughing, we show you the product and quote the price, but more importantly, we give you peace of mind. 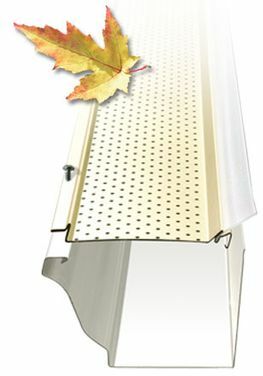 We install the one and only leaf guard with a 25-year warranty. Made of top-quality aluminum, the Gutter Clean System™ is solid; it will never rust and will not deteriorate. Take a moment to view the following video to see how Alu-Rex products protect your eavestroughs for the effects of ice and snow, leaves and debris. The Gutter Clean System™ is a perforated aluminum sheet that attaches on top of any eavestrough that has already been installed on your home. It is invisible from the ground and does not change the appearance of your home at all; the aesthetic and integrity of your residence is entirely maintained. With the Gutter Clean System™ you no longer have to worry because it takes care of any possible eavestrough problem. Our system blocks leaves, snow, ice and all sorts of debris from entering your eavestroughs. Since snow and ice cannot enter the eavestroughs there is less weight that they have to support. This unique and innovative product is compatible with any type of eavestrough and our professional team can install it in less than half a day. Water can flow normally inside your eavestroughs all year round because seasonal debris is not allowed to enter! Thanks to innovative Alu-Perf technology developed by Alu-Rex, the Gutter Clean System™ can efficiently distribute almost 3-times the amount of daily precipitation that has ever been recorded in Canada and can fight off debris with unmatched effectiveness. Known for quality and durability throughout the world, Alu-Rex products have satisfied many thousands of homeowners. Dripping water can cause corrosion on the fittings that attach the eavestroughs to your home, as well as unsightly black lines called “tiger stripes”. Both conditions seriously diminish the aesthetic of your property. Often, the most brilliant ideas are also the simplest. 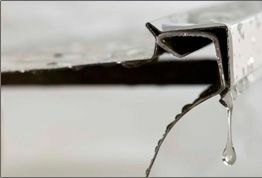 The state-of-the-art design of the leaf guard in combination with the Dura-Clean option deflects dripping water while shielding any rusty spikes in your eavestrough support attachments. Canada is home to 74 different species of mosquitoes, 64 varieties of which feed on humans and domestic animals. 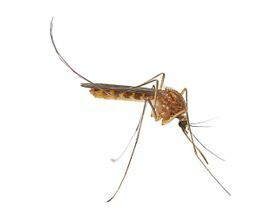 Mosquitos look for a moist environment to lay their eggs, and if your eavestroughs are retaining stagnant water because they are being blocked by leaves, mosquitos will make themselves at home by the thousands. Make sure your eavestroughs are flowing freely and enjoy a pest-free environment with help from Bourgon Eavestroughing. Contact us today to schedule a free estimate, inspection and consultation at your home or business.